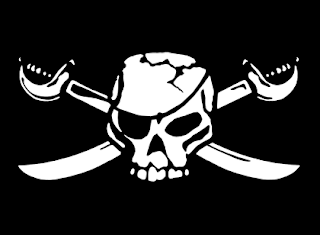 Ahoy lan'lubbers, unless ye be sailing the murky waters of the underworld, it shud be known to ye that this day, Saturday the 19th day in September, be International Talk Like A Pirate Day. Gar. What'ever business ye be carryin' on with be sure to remember that ye must do it in proper tone and language. All the words that'd be there to explain it all can be found here, me hearties. Or if ye be not with the smarts to read, listen to Cap'in who be responsible for dis gran' day. Aaarrrrrr for those first mates what be on the Book o' Faces, listen to me words carefully. Go to the bottum o yer page and look for the secret clicker that be marked with words 'English (UK)'. Press yer cursor over these strange words and a pop-up will appear there right before yer eyes. Find the place that be sayin' 'English (Pirate)' and press it. Then ye be seeing yer Book o' Faces in a whole new light. Good luck ye scurvy doggs. Garrrr.